For users looking to get more out of Eclipse, there is Eclipse Pro. 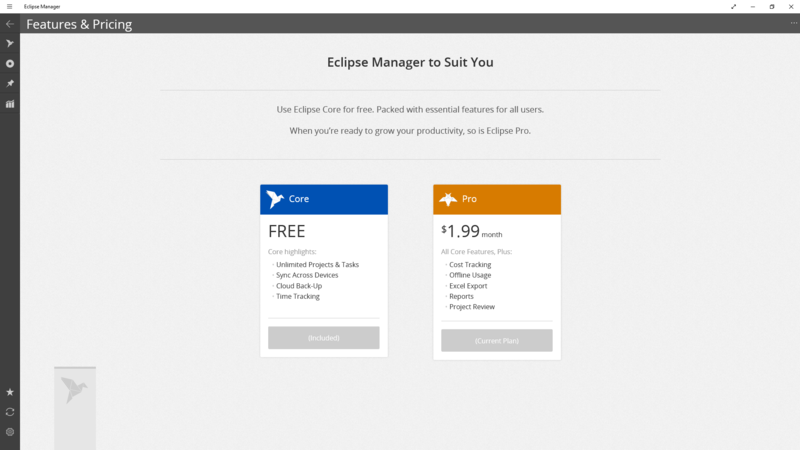 Eclipse Pro costs $1.99/month and brings lots of great features. Eclipse Core requires a constant internet connection to sync the files to the server. With Eclipse Pro you can take your computer offline and then sync the tasks when you reconnect. You can only upgrade inside your Eclipse app. Open the app and visit the star down the left hand side, which will take you to the “Features & Pricing” page. From here click on “Upgrade” in the “Pro” list. All payments are handled through Microsoft and are completely secure. Because of this you need to make sure you have payment details associated with your Microsoft account.